1. Dissolve yeast in warm water in large bowl. Set aside. 3. After milk & butter cools for a few minutes, stir the egg, salt & milk mixture into the yeast. 4. Using a fork, stir in sugar & 2 cups flour to form a batter. 5. Add enough additional flour to make dough easy to handle. 6. Knead dough on floured surface for five minutes. Add additional flour, if needed. Place dough in greased bowl covered with a damp cloth, in a warm place, to rise until doubled, at least 1 hour. 7. 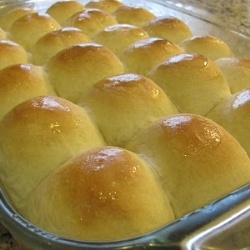 Punch dough down and shape into rolls. Place in greased 9x13 pan & cover & allow to rise again. 8. Bake at 350 degrees for 15 minutes or until golden brown. Brush with melted butter & serve.